It’s hard to be unhappy with an ice cream cone in your hand. And smiles are all you can see from open to close at Leopold’s Ice Cream in downtown Savannah. The vintage parlor was founded in 1919 by the three Leopold brothers, recent immigrants from Greece. The shop offered malts and milkshakes as well as handmade ice cream from family recipes. The famed Tutti-Frutti flavor was a favorite for many locals, including Oscar-winning songwriter Johnny Mercer. The original location on Gwinnett closed in 1969 after decades of serving frozen treats on hot summer afternoons. Peter Leopold’s youngest son, Stratton, was pursuing a successful Hollywood career but he maintained close ties with his hometown. He kept most of the fixtures and equipment in storage, hopeful that one day he would be able to use them again. 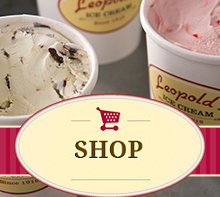 In 2004, Stratton and his wife Mary were finally able to announce the reopening of Leopold’s Ice Cream at 212 E. Broughton Street. They incorporated the original marble countertops and Stratton still makes ice cream with the old freezing equipment. Not only does Leopold’s use their secret formulas, they don’t mind telling you that they use all real, natural ingredients. Each batch is made on-site and only the best makes it into each scoop. You’ll be greeted by friendly staff wearing custom-made hats who are ready to let you taste as many flavors as you like. Be sure to make a trip to the local ice cream parlor while visiting Savannah.